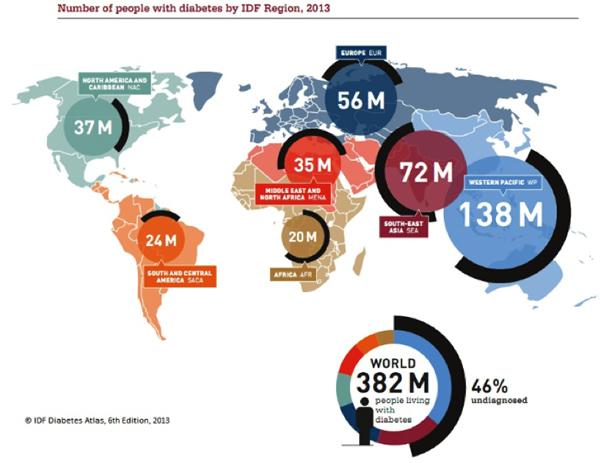 The scale of the global epidemic of obesity, metabolic syndrome and diabetes are truly staggering. Though evidence of a looming global healthcare crisis is plainly visible, few seem to realize the consequences will be catastrophic to individuals, households and national economies. Here is a list—by no means exhaustive—of major health issues threatening hundreds of millions of people globally. 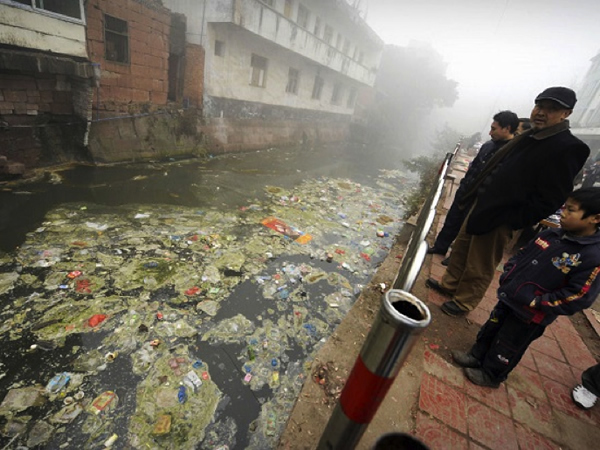 The statistics are equally horrendous: roughly 40% of all deaths in Pakistan result from polluted drinking water, 500 million people in China lack clean drinking water, and in India, 90% of human waste flows untreated into rivers. 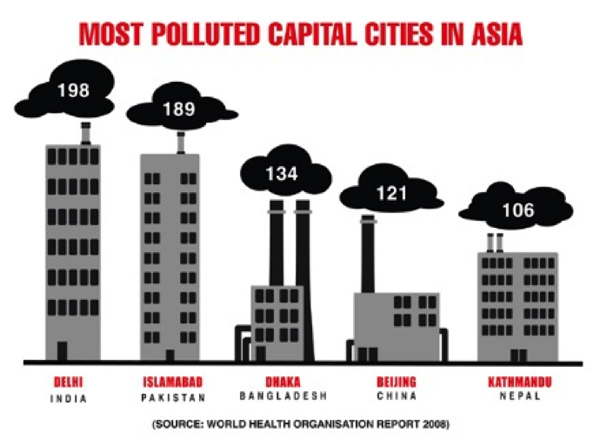 Air and water pollution do not stop at borders, and so severe pollution in developing economies has become a health issue in neighboring developed economies as well. 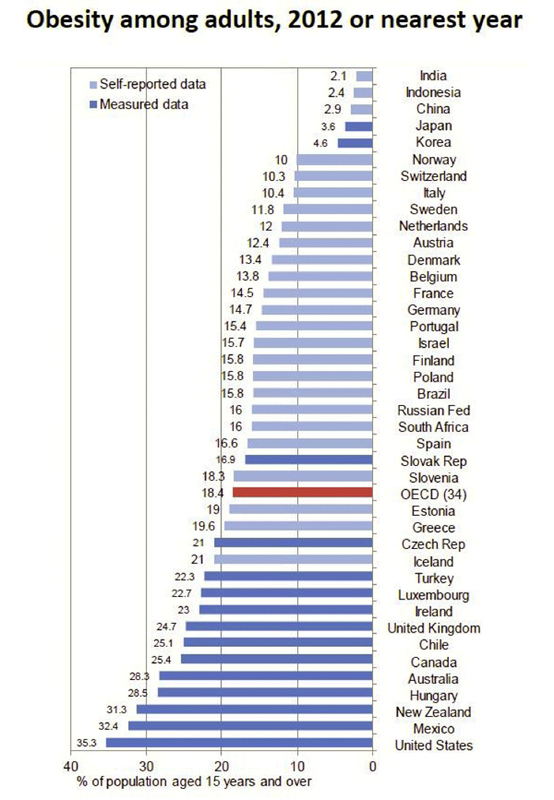 As populations age, health costs rise while the working-age population that must support higher healthcare expenses declines, burdening the middle-aged workers who must support the elderly and the young. Caring for a rapidly expanding population of elderly retirees burdens governments and economies as well as households: as income is taxed to pay for care, there is less money available for other programs and investing in future productivity. We all know why healthcare costs rise as the population of elderly retirees grows: chronic non-communicable diseases go hand in hand with age. The costs of treating these lifestyle/ageing diseases (metabolic syndrome, heart disease, high blood pressure, etc.) 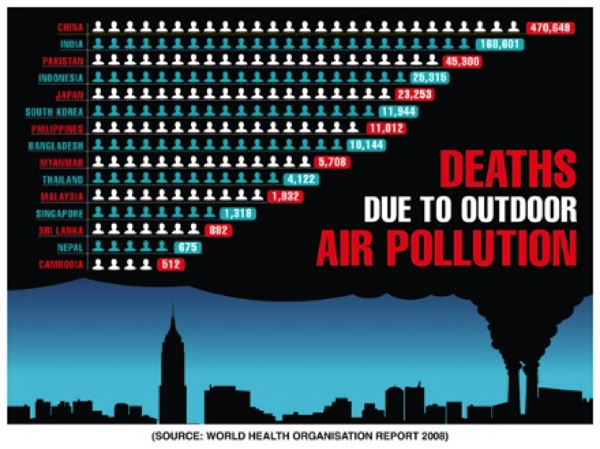 soar as the population and incidence of these diseases both rise. 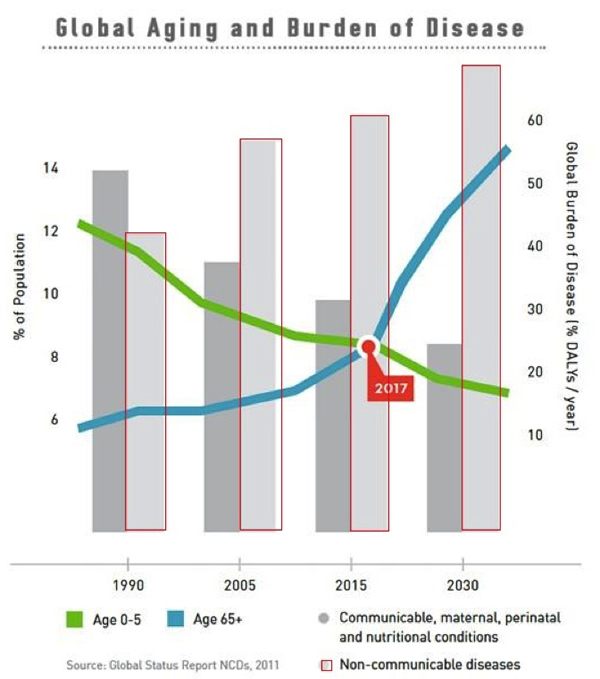 Globally, elderly populations are rising even in developing nations. 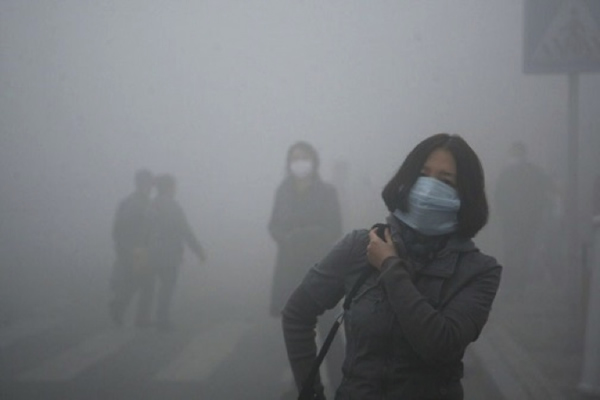 Over 1 billion people smoke cigarettes globally, with some 350 million smokers residing in China. Over one million deaths per year in China are attributed to smoking, but some estimates project this number rising to 3.5 million annually. This epidemic will overwhelm a global healthcare system that is already struggling to provide care for an aging population. 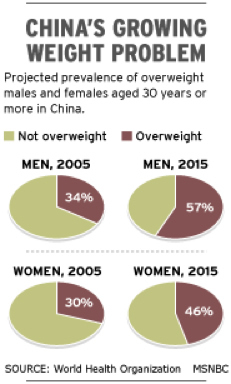 Meanwhile, other sources have published estimates of overweight/obesity in China that parallel data from developed nations with equivalent rates of diabetes. 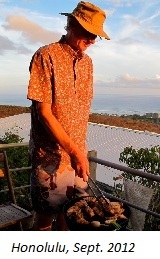 Clearly, the factors linked to metabolic syndrome—diets rich in refined foods, sugar, and unhealthy fats, a lack of exercise, etc.—are on the rise in developing nations, regardless of the supposed rate of obesity (generally defined as a body mass index (BMI) of over 30) and being overweight (generally defined as a BMI of over 25). Though few connect global health with the rising human population, common sense suggests that the global competition for resources and the rising costs of providing basics such as clean water and air, and energy and food security, will pressure global health for purely financial reasons: if national incomes are increasingly devoted to expenditures such as military forces, energy and food security, interest due on sovereign debt, etc., relatively fewer resources will be available to fund healthcare for the rising numbers of elderly retirees and the enormous populations suffering from chronic diseases that require constant monitoring and treatment. Many people look to technology to solve these inter-related problems. 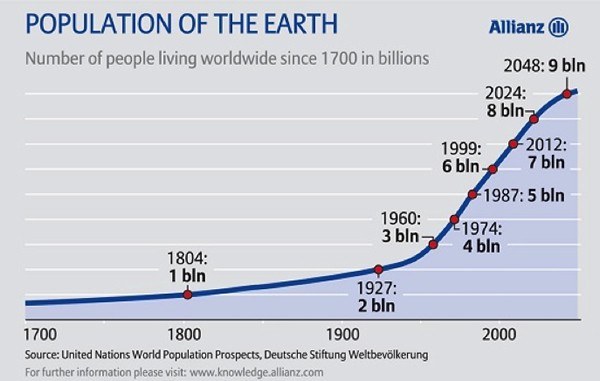 Perhaps miraculous advances in biochemistry will solve all these global health crises. But a cautious skepticism is in order, for all sorts of wondrous but costly technologies that work in the lab and small-scale experiments fail to scale, i.e. become cheap enough and reliable enough to spread quickly around the world. Advanced technologies require vast quantities of capital, expertise and energy to spread throughout the global economy. The necessary capital and resources are precisely what will be in short supply as demands on tax revenues and social safety nets skyrocket. 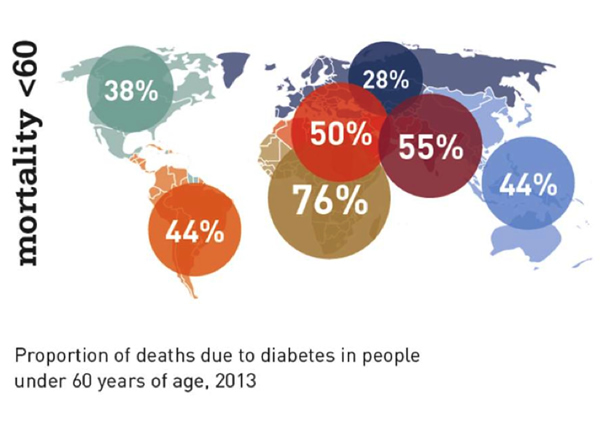 Despite these concerning global trends, health is determined at the individual level. Each one of us has the ability to improve our own personal health situation -- starting right now. In Part 2: Putting Our Health Into Our Own Hands, we explore what we can do, as individuals and households, in response to the trends discussed above. As discussed in Chris' and Adam's recent book Prosper!, one of the most important components of true wealth is Living Capital -- the most essential component of which is our own bodies. Prioritizing our investments there gives us the best foundation upon which to pursue all of our other future goals. 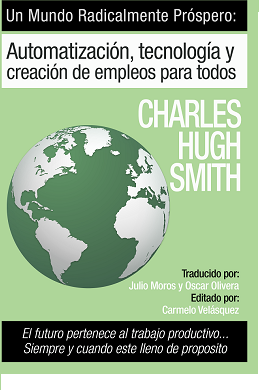 My new book is #5 in Amazon's Kindle ebooks > Business & Money > International Economics: A Radically Beneficial World: Automation, Technology and Creating Jobs for All. 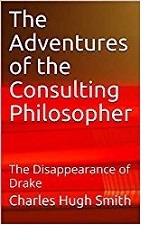 The Kindle edition is $$9.95 and the print edition is currently discounted to $21.60. Thank you, Joel M. (book), for your most generous contribution to this site -- I am greatly honored by your steadfast support and readership. Thank you, D.M.T. ($111), for yet another outrageously generous contribution to this site -- I am greatly honored by your steadfast support and readership. 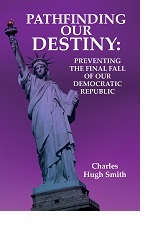 Any serious reform has to start with the dissolution of the existing political parties and the Federal Reserve. Anything less is self-serving, pandering fantasy. Well-paid econo-pundit Joseph Stiglitz has a new book that repeats the usual pandering fantasy that "reform" can fix what's broken with the U.S. economy:Rewriting the Rules of the American Economy: An Agenda for Growth and Shared Prosperity. Stiglitz has penned an economist's equivalent of round up the usual suspects: if only we limit rentier skims, too big to fail banks and "democracy" auctioned off to the highest bidder, everything will be peachy: debt-serfs' wages will magically soar and all the inequalities in our society and economy will magically disappear. Stiglitz appears blind to the reality that everything he suggests would harm the interests of those who own the nation's wealth and fund the country's political class. Every proposal is DOA (dead on arrival), a fantasy that panders to the dearly held delusion that "reform" is not just possible but useful. "Friends, Romans, countrymen, lend me your ears, for I propose a new agenda for Imperial Rome. First, I suggest eliminating the sources and machinery of your power and wealth. 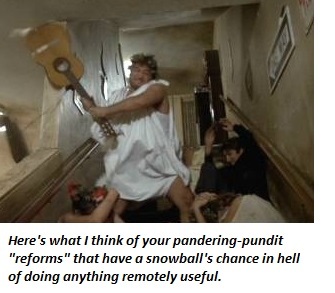 Second..."
The would-be reformer is then interrupted by uproarious laughter, for the audience assumes only a toga-clad comedian would propose the decimation of their wealth and power as a "reform." Like all well-paid pandering pundits, Stiglitz carefully turns a blind eye to the failed system that issues his paycheck: for the vast majority of well-paid pandering pundits, this is higher education/academia and/or the mainstream media. 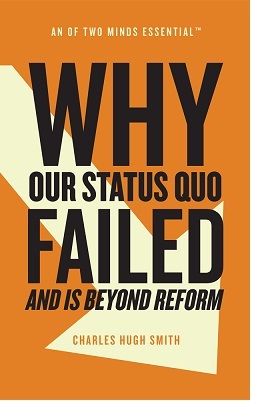 It's altogether too easy to propose phony "reforms" of the financial sector--that's like shooting fish in a barrel--especially when you know ahead of tme absolutely none of the "reforms" have a snowball's chance in heck of being remotely useful in the real world. What well-paid pandering pundits like Stiglitz never dare to criticize are the failed, broken cartels that are equally deserving of being disrupted and dismantled: higher education, sickcare ("healthcare") and the corporate media, each of which have failed the nation as completely as the financial sector and the political class. In terms of the real-world impact on households, the soaring costs of higher education and healthcare are more crushing than Wall Street's skim. In terms of culpability, the corporate media that pays pundits like Stiglitz turned a blind eye to the financial fraud for years, and only belatedly began reporting the consequences when the Global Financial Meltdown was well under way and could no longer be ignored. The corporate/NGO/PBS media loves this sort of phony "reform" because it suggests democracy is still functioning in America and that the media plays an important role in the phony "dialog" of well-paid Establishment-crony pundits and media anchors. This sort of "serious" call for "reform" by a "serious" well-paid pundit is the equivalent of Silicon Valley Unicorn startups that claim to be real companies despite a lack of revenues and profits. Reforming the Empire is fantasy, and well-paid pandering pundits know it. But the faux-earnest appeals for "reform" make for good copy and even better PR. Any serious reform has to start with the dissolution of the existing political parties and the Federal Reserve and the reining in of the Deep State. Anything less is self-serving, pandering fantasy. My new book is #4 in Amazon's Kindle ebooks > Business & Money > International Economics: A Radically Beneficial World: Automation, Technology and Creating Jobs for All. 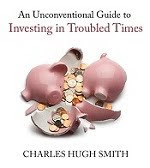 The Kindle edition is $8.45, a 15% discount from its list price of $9.95. Thank you, Dana D. ($10), for your most excellently generous contribution to this site--I am greatly honored by your steadfast support and readership. The decline of middle class capital is partly self-inflicted. Conventional explorations of why the middle class is shrinking focus on economic issues such as the decline of unions and manufacturing, the increasing premiums paid to the highest-paid workers and the rising costs of higher education and healthcare. All of these factors have a role, but few comment on the non-economic factors, specifically the values that underpin the accumulation of capital that is the one essential project of middle class households. Daniel Bell's landmark 1976 book The Cultural Contradictions of Capitalism held that"capitalism--and the culture it creates--harbors the seeds of its own downfall by creating a need among successful people for personal gratification--a need that corrodes the work ethic that led to their success in the first place." The primary cultural contradiction of the Great American Middle Class is the disconnect between the values needed to build capital and those of gratification via debt-based consumption. 1. Sacrifice of current consumption in favor of accumulating capital to be invested. 2. Thrift: repairing broken items, buying used replacements, waiting for deep discounts, etc. 3. Personal integrity and trustworthiness above all else. One's word is one's bond. 4. Self-discipline/self-control in service of long-term goals and the other values. 5. Humility: there is always more to learn; pride goeth before a fall. 6. Lifelong learning: human capital is skills and experience. Adding skills and experience takes work, focus, accountability--what I call the eight essential skills in my book Get a Job, Build a Real Career and Defy a Bewildering Economy. 7. Accumulating the social capital of emotional intelligence and trustworthy collaborators. 8. Setting and achieving long-term goals: saving enough money to buy a home or investment property with a 50% down payment, saving enough to pay for college in cash (with the student working part-time in the academic term and fulltime in summers), etc. 9. The desire to own productive assets rather than unproductive bling such as luxury vehicles or a fancy home. 10. Work-family-leisure balance: avoid burnout and maintain strong family/friends ties. Arrayed against these capital-accumulation-disciplined values are the consumerist values of instant gratification, short-term horizons, lack of long-term goals, self-indulgence, impulse buying, keeping up with the Joneses (i.e. competitive consumption), and an obsessive focus on the social/consumption pecking order of one's peers, all of which incentivize debt-based consumption that spends future earnings today on non-essentials. I was astonished to read in $100,000 and up is not enough – even the 'rich' live paycheck to paycheck that busy couples spend $2,000 to $2,600 per month eating out. That's roughly $30,000 a year, the equivalent of a brand-new vehicle plus a used car or one year of college--or a down payment on a rental home in a non-bubble locale. The article contends that "Many 'rich' people have problems accepting that they aren’t really that wealthy and the money will not last forever." This is an excellent summary of the consumerist mentality: income, wealth and financial security are all grossly over-estimated while debt is under-estimated. Conventional Americans may wonder how recent legal immigrants with modest-paying jobs buy homes and pay off the mortgage in a few years and then send their kids to university with zero student loans. In a conventional consumerist household earning two times as much annual gross income, this is viewed as "impossible." 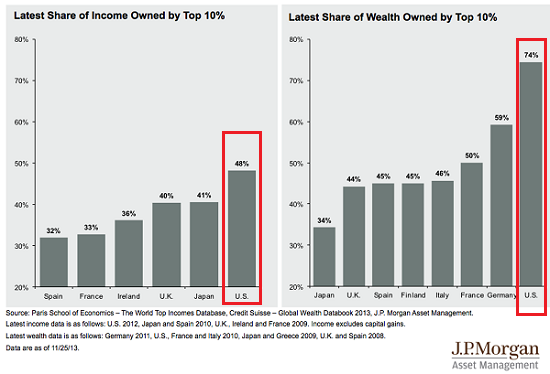 The point is the decline of middle class capital is partly self-inflicted. Yes, wages are stagnant, the system encourages consumption, and our self-serving politicos encourage the view that if we stop buying on credit the nation will collapse. Yes, we will experience a recession, but that is simply the order of things when debt-based consumption runs ahead of productivity. The nation will survive, and those who are prepared may finally be able to buy assets at fair-market values. We can't change the system on our own, but we can change the way we respond to rising inequality and insecurity: we can consume/borrow our way to poverty or we can accumulate capital, skills, moxie and productive assets. Learning more valuable skills is now essentially free. What it requires is a value system that supports long-term goals, self-discipline and a desire to solve problems rather than indulge in the self-destructive pleasures of indignation. Thank you, J. L. ($5/month), for your superbly generous subscription to this site--I am greatly honored by your support and readership. If it takes more than $126,000 to fund a qualitatively defined middle class lifestyle, what sense does it even make to call this "middle"? The Pew Research Center's recent report The American Middle Class Is Losing Ground: No longer the majority and falling behind financially made a media splash, as it reported that less than 50% of adults are members of the Great American Middle Class. My analysis suggests that by more qualitative measures, no more than a third of U.S. households qualify as middle class: claiming 49% of the nation's households are still middle class is a gross exaggeration. 1. Meaningful healthcare insurance ($5,000 deductible healthcare plans don't qualify; they are simulacrum/phantom coverage). 2. Significant equity (25%+) in a home or other real estate. 3. Income/expenses that enable the household to save at least 6% of its income. 4. 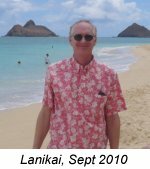 Significant retirement funds: 401Ks, IRAs, etc. 5. The ability to service all expenses over the medium-term if one of the primary household wage-earners lose their job. 6. Reliable vehicles for each wage-earner. 7. The household does not depend on government assistance to maintain the family lifestyle. 8. A percentage of hard assets beyond the family home that can be transferred to the next generation. 9. Surplus income to invest in children (extracurricular activities, lessons, etc.). 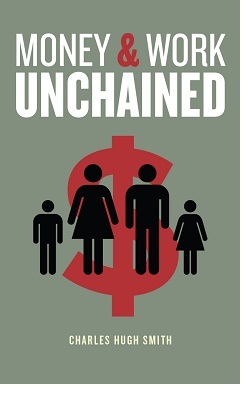 -- the ability (and willingness) to transfer accumulated real wealth to the next generation. Income is not an accurate proxy, as many high-income households are living paycheck to paycheck: regardless of their income, they don't qualify as middle class by qualitative standards. Middle class is more than income--it's a value system that recognizes the necessity of sacrifice, frugality, capital and long-term planning. If high-income households squander all the income on eating out, lavish vacations, matching luxury-brand autos, etc., they aren't middle class: their values do not support investing in their children's future, their own retirement (so they won't be a burden to their adult kids) and on building wealth that won't vanish when the current asset bubble bursts. By my calculation (admittedly coarse, given the huge range of living expenses from lower-cost regions to sky-high locales on the Left and Right Coasts), around $100,000 for state/corporate employed adults (i.e. jobs that provide healthcare and retirement/401K benefits) and $130,000+ for self-employed people (who have to pay their own healthcare and retirement costs) is more or less the minimum required to fund the qualities described above. It's remarkably easy to earn this income and have very little to show for it by year-end, so this is (at least in many areas) bare-bones. 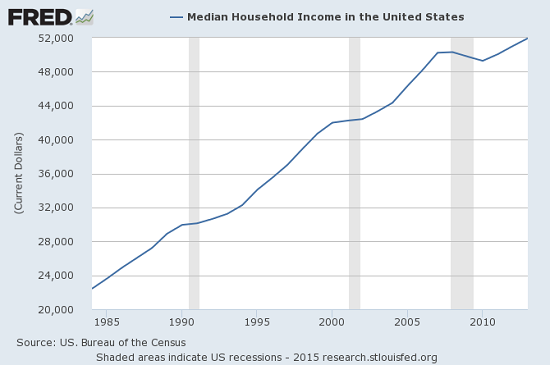 As you can in this chart of nominal (not adjusted for inflation) median household income, this is roughly double median household income of $52,000 annually. The Pew report places households with incomes from from $42,000 to $126,000 as middle class. Judging by my estimates, it would very difficult to meet these qualitative standards on $52,000 household income unless housing was nearly free (for example, the family house was owned free and clear and property taxes were low). In many Left and Right Coast cities, $52,000 is essentially poverty level. Even in lower-cost areas, it would take at least 50% above median household income to fund a middle class life. Meanwhile, the Federal Reserve's policy of inflating bubbles in assets that were once stable places to build lasting equity (for example, housing) has devastated middle class wealth. 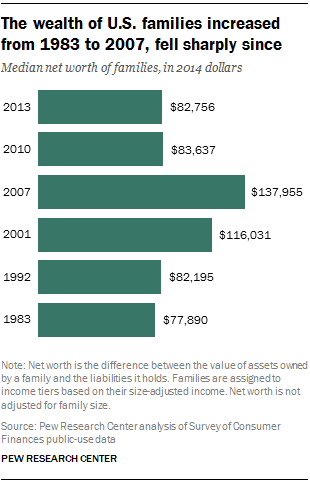 Adjusted for inflation (which is likely under-stated, since big-ticket items such as college tuition and healthcare are under-represented in official inflation), household wealth has gone nowhere for over 20 years. Two immense asset bubbles have inflated and popped in the past 15 years, and what has that done for middle class wealth? Nothing positive. The current credit-asset bubbles are now poised to burst. What will that do to what remains of middle class wealth? We can be sure it won't be positive. If we consider the qualitative requirements, it is unlikely that more than one-third of households qualify as middle class. If it takes more than $126,000 to fund a qualitatively defined middle class lifestyle, what sense does it even make to call this "middle"? Thank you, William H. ($50), for yet another superlatively generous contribution to this site--I am greatly honored by your steadfast support and readership.